Do you have oil residue or stains on your garage floor? Are you looking to establish a clean look while adding a protective barrier to your garage floor? If so, epoxy coating is a beautiful, economical solution. Some people paint their garage floors, only to have them begin peeling, chipping and cracking after just a few months. Watson's Painting & Waterproofing Company applies an epoxy coating to garage floors to create a durable surface that looks great and is easy to clean. Epoxy Coatings for commercial or industrial flooring is the most cost effective method of preserving your flooring investment and promoting cleanliness throughout your facility. Most commercial buildings are built on a concrete slab. A protective barrier is required to protect the surface from corrosion due to spills, chips, chemicals, or weather. 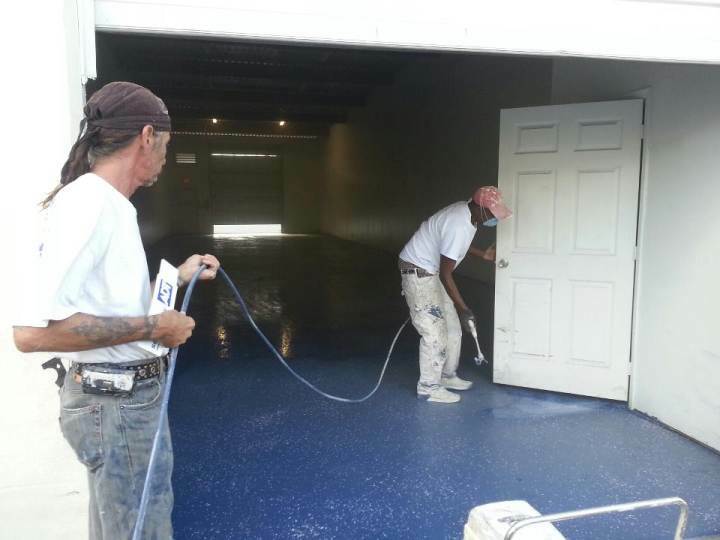 Watson's Painting & Waterproofing Company specializes in the application of Epoxy Coatings on commercial or industrial floors. Our coatings will protect your floors for years to come, and provide a smooth, polished surface that is attractive and easy to keep clean. Epoxy coatings bind to just about any surface and will dry quickly. Watson's Painting & Waterproofing Company will complete the work during your off hours as to not disrupt your business. Protect your customers and employees with a slip resistant finish. Epoxy also strengthens the floor's surface. Once we apply epoxy coating, the cleaning will become simple as well. Because the surface is nonporous, drips and spills will wipe up easily. No special care is required, and the strong surface is easily cleaned by mopping with a mild detergent.